Yesterday, a Q&A was hosted at the offices of DC Comics to promote the premiere of The Flash this evening (October 7) at 8PM on The CW. On the show’s quick pace with storylines: “One of the many, many great things about working with Greg Berlanti is [that] he is never one to say ‘let’s slow it down. Let’s just throw something out there and we’ll get to it eventually.’ There’s always a plan, and a payoff waiting in the wings, and Greg’s so great about making sure that all of the things that are set up in Episode 1 are paid off in this season,” Geoff Johns says. “I would say, for me, so many times we break it and talk about it like it’s a character drama, in part because of the actors that we have, and so, we’re like ‘here, guys. 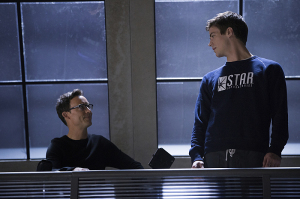 We want to see scenes between Flash and Wells. We want to see scenes between Joe and Wells.’ And so, we give them storylines. They all have storylines, and hopefully in some fun ways, they twist back, and they inform whatever the character’s larger agenda might be, but on the surface, they’re hopefully really enjoyable too, in terms of [who] they really are. I don’t think anybody’s witnessed [Barry] tell a lie yet. I think he’s been very truthful about a lot of things, and so that’ll be intriguing to watch how that plays out,” Greg Berlanti says. 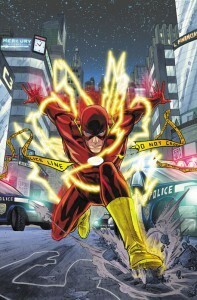 What would make The Flash a success? “Obviously we hope that the numbers are there, because we want the show to go for a long, long time, but I think if people fall in love with the characters, that’s the biggest win of all,” Geoff Johns says. Robbie Amell will be showing up as half of Firestorm – check out interview material about that HERE! If you watched The Flash illegally this summer, you’re on notice. “If you saw the pilot illegally, you have to still watch it [Tuesday] night, or we will all hunt you down! We know who you are. It is different. There’s three extra minutes! That’s what we like to say,” Greg Berlanti says. 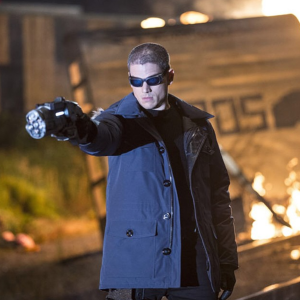 You don’t need to have seen Arrow to “get” The Flash. “Even though it is a spin-off, you don’t need to have watched a minute of Arrow, I think, to enjoy The Flash pilot and enjoy that world,” Kreisberg promises. 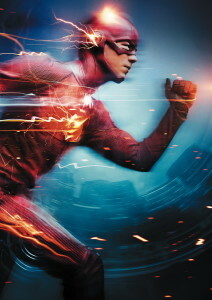 The Flash premieres tonight at 8PM on The CW. Come join the countdown on our forum!